The president is indirectly elected by an electoral college comprising the Parliament of India (both houses) and the legislative assemblies of each of India's states and territories, who themselves are all directly elected. Although the Article 53 of the Constitution of India states that the president can exercise his powers directly or by subordinate authority, with few exceptions, all of the executive powers vested in the president are, in practice, exercised by the prime minister (a subordinate authority) with the help of the Council of Ministers. The president is bound by the constitution to act on the advice of the prime minister and cabinet as long as the advice is not violating the constitution. The Indian constitution accords with the president, the responsibility and authority to defend and protect the Constitution of India and its rule of law. Invariably, any action taken by the executive or legislature entities of the constitution shall become law only after the President's assent. The president shall not accept any actions of the executive or legislature which are unconstitutional. The president is the foremost, most empowered and prompt defender of the constitution (Article 60), who has pre-emptive power for ensuring constitutionality in the actions of the executive or legislature. The role of the judiciary in upholding the Constitution of India is the second line of defence in nullifying any unconstitutional actions of the executive and legislative entities of the Indian Union. Under the draft constitution the President occupies the same position as the King under the English Constitution. He is the head of the state but not of the Executive. He represents the Nation but does not rule the Nation. He is the symbol of the Nation. His place in the administration is that of a ceremonial device on a seal by which the nation's decisions are made known. The primary duty of the president is to preserve, protect and defend the constitution and the law of India as made part of his oath (Article 60 of Indian constitution). The president is the common head of all independent constitutional entities. All his actions, recommendations (Article 3, Article 111, Article 274, etc.) and supervisory powers (Article 74(2), Article 78C, Article 108, Article 111, etc.) over the executive and legislative entities of India shall be used in accordance to uphold the constitution. There is no bar on the actions of the president to contest in the court of law. All bills passed by the parliament can become laws only after receiving the assent of the president per Article 111. After a bill is presented to him, the president shall declare either that he assents to the Bill, or that he withholds his assent from it. As a third option, he can return a bill to parliament, if it is not a money bill, for reconsideration. President may be of the view that a particular bill passed under the legislative powers of parliament is violating the constitution, he can send back the bill with his recommendation to pass the bill under the constituent powers of parliament following the Article 368 procedure. When, after reconsideration, the bill is passed accordingly and presented to the president, with or without amendments, the president cannot withhold his assent from it. The president can also withhold his assent to a bill when it is initially presented to him (rather than return it to parliament) thereby exercising a pocket veto on the advice of prime minister or council of ministers per Article 74 if it is inconsistent to the constitution. Article 143 gave power to the president to consult the supreme court about the constitutional validity of an issue. The president shall assent to constitutional amendment bills without power to withhold the bills per Article 368 (2). When either of the two Houses of the Parliament of India is not in session, and if the government feels the need for an immediate procedure, the president can promulgate ordinances which have the same force and effect as an act passed by parliament under its legislative powers. These are in the nature of interim or temporary legislation and their continuance is subject to parliamentary approval. Ordinances remain valid for no more than six weeks from the date the parliament is convened unless approved by it earlier. Under Article 123, the president as the upholder of the constitution shall be satisfied that immediate action is mandatory as advised by the union cabinet and he is confident that the government commands majority support in the parliament needed for the passing of the ordinance into an act and parliament can be summoned to deliberate on the passing of the ordinance as soon as possible. The promulgated ordinance is treated as an act of parliament when in force and it is the responsibility of the president to withdraw the ordinance as soon as the reasons for promulgation of the ordinance are no longer applicable. Bringing laws in the form of ordinances has become a routine matter by the government and President, but the provisions made in Article 123 are meant for mitigating unusual circumstances where immediate action is inevitable when the extant provisions of the law are inadequate. Re-promulgation of an ordinance after failing to get approval within the stipulated time of both houses of parliament is an unconstitutional act by the president. The President should not incorporate any matter in an ordinance which violates the constitution or requires an amendment to the constitution. The president should take moral responsibility when an ordinance elapses automatically or is not approved by the parliament or violates the constitution. Per Article 53, the executive power of the country is vested in the president and is exercised by President either directly or through officers subordinate to him in accordance with the constitution. When parliament thinks fit it may accord additional executive powers to the president per Article 70 which may be further delegated by the president to the governors of states per Article 160. Union cabinet with prime minister as its head, should aid and advice the president in performing his functions. Per Article 74 (2), the council of ministers or prime minister are not accountable legally to the advice tendered to the president but it is the sole responsibility of the president to ensure compliance with the constitution in performing his duties. President or his subordinate officers is bound by the provisions of the constitution notwithstanding any advice by union cabinet. Per Article 142, it is the duty of President to enforce the decrees of the supreme court. The primary duty of the president is to preserve, protect and defend the constitution and the law of India per Article 60. The president appoints the Chief Justice of India and other judges on the advice of the chief justice. He dismisses the judges if and only if the two Houses of the parliament pass resolutions to that effect by a two-thirds majority of the members present. The Indian government's chief legal adviser, Attorney General of India ,is appointed by the President of India under Article 76(1) and holds office during the pleasure of the president. If the president considers a question of law or a matter of public importance has arisen, he can also ask for the advisory opinion of the supreme court per Article 143. Per Article 88, President can ask the Attorney General to attend the parliamentary proceedings and report to him any unlawful functioning if any. The president appoints as prime minister, the person most likely to command the support of the majority in the Lok Sabha (usually the leader of the majority party or coalition). the president then appoints the other members of the Council of Ministers, distributing portfolios to them on the advice of the prime minister. :72 The Council of Ministers remains in power at the 'pleasure' of the president. Governors of states are also appointed by the president who shall work at the pleasure of the president. Per Article 156, President is empowered to dismiss a governor who has violated the constitution in his acts. The chief justice and other judges of the Supreme Court of India and state/union territory high courts. The Chief Minister of the National Capital Territory of Delhi (Article 239 AA 5 of the constitution). The Chairman and other Members of the Union Public Service Commission. Ambassadors and High Commissioners to other countries (only through the list of names given by the prime minister):48. Officers of the All India Services (IAS, IPS and IFoS), and other Central Civil Services in Group 'A'. A money bill can be introduced in the parliament only with the President’s recommendation. The president lays the Annual Financial Statement, i.e. the Union budget, before the parliament. The president can take advances out of the Contingency Fund of India to meet unforeseen expenses. The president is the Supreme Commander of the Indian Armed Forces. The president can declare war or conclude peace, on the advice of the Union Council of Ministers headed by the prime minister. All important treaties and contracts are made in the President's name. Punishment is for an offence against Union law. Punishment is by a military court. A sentence that is of death. National Emergency has been proclaimed 3 times in India till date. It was declared first in 1962 by President Sarvepalli Radhakrishnan, during the Sino-Indian War. This emergency lasted through the Indo-Pakistani War of 1965 and up to 1968. It was revoked in 1968. The second emergency in India was proclaimed in 1971 by President V. V. Giri on the eve of the Indo-Pakistani War of 1971. The first two emergencies were in the face of external aggression and War. They were hence external emergencies. Even as the second emergency was in progress, another internal emergency was proclaimed by President Fakhruddin Ali Ahmed, with Indira Gandhi as prime minister in 1975. In 1977, the second and the third emergencies were together revoked. If the president is not fully satisfied, on the basis of the report of the governor of the concerned state or from other sources that the governance in a state cannot be carried out according to the provisions in the constitution, he can proclaim under Article 356 a state of emergency in the state. Such an emergency must be approved by the parliament within a period of 2 months. By Article 365 – If that state is not working according to the direction of the Union government issued per the provisions of the constitution. The Sarkaria Commission held that presidents have unconstitutionally misused the provision of Article 356 many times for achieving political motives, by dismissing the state governments although there was no constitutional break down in the states. During 2005, President's rule was imposed in Bihar state, misusing Article 356 unconstitutionally to prevent the democratically elected state legislators to form a government after the state elections. There is no provision in the constitution to re-promulgate president's rule in a state when the earlier promulgation ceased to operate for want of parliaments approval within two months duration. During 2014 in Andhra Pradesh, president's rule was first imposed on 1 March 2014 and it ceased to operate on 30 April 2014. President's rule was promulgated after being fully aware that the earliest parliament session is feasible at the end of May 2014 after the general elections. It was reimposed again unconstitutionally on 28 April 2014 by the president. Article 282 accords financial autonomy in spending the financial resources available with the states for public purpose. Article 293 gives liberty to states to borrow without any limit to its ability for its requirements within the territory of India without any consent from the Union government. However, Union government can insist for compliance of its loan terms when a state has outstanding loan charged to the consolidated fund of India or an outstanding loan in respect of which a guarantee has been given by the Government of India under the liability of consolidated fund of India. Under article 360 of the constitution, President can proclaim a financial emergency when the financial stability or credit of the nation or of any part of its territory is threatened. However, until now no guidelines defining the situation of financial emergency in the entire country or a state or a union territory or a panchayat or a municipality or a corporation have been framed either by the finance commission or by the central government. The president can reduce the salaries of all government officials, including judges of the supreme court and high courts, in cases of a financial emergency. All money bills passed by state legislatures are submitted to the president for approval. He can direct the state to observe certain principles (economy measures) relating to financial matters. In the event that the vice-president, a state governor or a minister is elected President, they are considered to have vacated their previous office on the date they begin serving as President. A member of parliament or of a State Legislature can seek election to the office of the president but if he is elected as President, he shall be deemed to have vacated his seat in parliament or State Legislature on the date on which he enters upon his office as President [Article 59(1)]. Article 57 provides that a person who holds, or who has held, office as President shall, subject to the other provisions of this constitution, be eligible for re-election to that office. Under The Presidential and Vice-Presidential Elections Act, 1952, a candidate to be nominated for the office of president needs 50 electors as proposers and 50 electors as seconders for his name to appear on the ballot. The president shall not be a member of either house of the parliament or of a house of the legislature of any state, and if a member of either house of the parliament or of a house of the legislature of any state be elected President, he shall be deemed to have vacated his seat in that house on the date on which he enters upon his office as President. Whenever the office becomes vacant, the new President is chosen by an electoral college consisting of the elected members of both houses of parliament (M.P.s), the elected members of the State Legislative Assemblies (Vidhan Sabha) of all States and the elected members of the legislative assemblies (MLAs) of two union territories, i.e., National Capital Territory (NCT) of Delhi and Union Territory of Puducherry. The election process of President is more extensive process than prime minister who is also elected indirectly (not elected by people directly) by the Lok Sabha members only. Whereas President being the constitutional head with duties to protect, defend and preserve the constitution and rule of law in a constitutional democracy with constitutional supremacy, is elected in an extensive manner by the members of Lok Sabha, Rajya Sabha and state legislative assemblies in a secret ballot procedure. The nomination of a candidate for election to the office of the president must be subscribed by at least 50 electors as proposers and 50 electors as seconders. Each candidate has to make a security deposit of ₹15,000 (US$210) in the Reserve Bank of India. The security deposit is liable to be forfeited in case the candidate fails to secure one-sixth of the votes polled. The election is held in accordance with the system of proportional representation (PR) by means of the single transferable vote (STV) method. The voting takes place by a secret ballot system. The manner of election of President is provided by Article 55 of the constitution. Each elector casts a different number of votes. The general principle is that the total number of votes cast by Members of parliament equals the total number of votes cast by State Legislators. Also, legislators from larger states cast more votes than those from smaller states. Finally, the number of legislators in state matters; if a state has few legislators, then each legislator has more votes; if a state has many legislators, then each legislator has fewer votes. The actual calculation for votes cast by a particular state is calculated by dividing the state's population by 1000, which is divided again by the number of legislators from the State voting in the electoral college. This number is the number of votes per legislator in a given state. Every elected member of the parliament enjoys the same number of votes, which may be obtained by dividing the total number of votes assigned to the members of legislative assemblies by the total number of elected representatives of the parliament. The President of India used to receive ₹10,000 (US$100) per month per the Second Schedule of the constitution. This amount was increased to ₹50,000 (equivalent to ₹170,000 or US$2,300 in 2018) in 1998. On 11 September 2008, the Government of India increased the salary of the president to ₹1.5 lakh (equivalent to ₹3.1 lakh or US$4,300 in 2018). This amount was further increased to ₹5 lakh (US$7,000) in the 2018 Union budget of India. However, almost everything that the president does or wants to do is taken care of by an annual ₹225 million (equivalent to ₹470 million or US$6.5 million in 2018) budget that the Government allots for his or her upkeep. 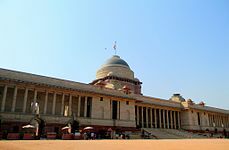 Rashtrapati Bhavan, the president's official residence, is the largest presidential palace in the world. The Rashtrapati Nilayam at Bolarum, Hyderabad and Retreat Building at Chharabra, Shimla are the official Retreat Residences of the President of India. The official state car of the president is a custom-built heavily armoured Mercedes Benz S600 (W221) Pullman Guard. The former presidents and spouses of deceased Presidents are eligible for pension, furnished accommodation, security, various allowances, etc. Supreme court shall inquire and decide regarding all doubts and disputes arising out of or in connection with the election of a president per Article 71(1) of the constitution. supreme court can remove the president for the electoral malpractices or upon being not eligible to be Lok Sabha member under the Representation of the People Act, 1951. Subject to Article 71 (3), parliament made applicable rules/procedure to petition the supreme court for resolving the disputes only that arise during the election process of the president but not the doubts that arise from his unconstitutional actions/deeds or changing Indian citizenship during the tenure of president which may violate the requisite election qualifications. The president may also be removed before the expiry of the term through impeachment for violating the Constitution of India by the Parliament of India. The process may start in either of the two houses of the parliament. The house initiates the process by levelling the charges against the president. The charges are contained in a notice that has to be signed by at least one-quarter of the total members of that house. The notice is sent up to the president and 14 days later, it is taken up for consideration. A resolution to impeach the president has to be passed by a two-thirds majority of the total number of members of the originating house. It is then sent to the other house. The other house investigates the charges that have been made. During this process, the president has the right to defend oneself through an authorised counsel. If the second house also approves the charges made by special majority again, the president stands impeached and is deemed to have vacated their office from the date when such a resolution stands passed. No president has faced impeachment proceedings so the above provisions have never been used. Under Article 361 of the constitution, though the president cannot be summoned for questioning except on his voluntary willingness to testify in the court in support of his controversial deeds, the unconstitutional decisions taken by the president would be declared invalid by the courts. The case would be decided by the courts based on the facts furnished by the Union government for the president's role. As clarified by the supreme court in the case Rameshwar Prasad & Ors vs Union Of India & Anr on 24 January 2006; though the president cannot be prosecuted and imprisoned during his term of office, he can be prosecuted after he/she steps down from the post for the guilty committed during the term of presidency as declared earlier by the courts. No president has resigned on impropriety to continue in office for declaring and nullifying his unconstitutional decisions by the courts till now. No criminal case at least on the grounds of disrespecting constitution is lodged till now against former presidents to punish them for their unconstitutional acts; though many decisions taken during the term of a president have been declared by the supreme court as unconstitutional, mala fides, void, ultra vires, etc. Article 65 of the Indian constitution says that the Vice-President of India will have to discharge the duties, if the office falls vacant due to any reason other than the expiry of the term. :20.10 The vice-president reverts to their office when a new President is elected and enters office. When the president is unable to act because of absence, illness or any other cause, the vice-president discharges the President's functions until the president resumes the duties. 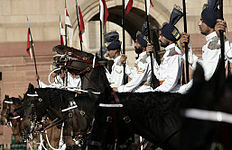 The Indian parliament has enacted the law—The President (Discharge of Functions) Act, 1969 — for the discharge of the functions of the president when vacancies occur in the offices of the president and of the vice-president simultaneously, owing to removal, death, resignation of the incumbent or otherwise. In such an eventuality, the chief justice—or in his absence, the senior most judge of the Supreme Court of India available—discharges the functions of the president until a newly elected President enters upon his office or a newly elected Vice-president begins to act as President under Article 65 of the constitution, whichever is the earlier. :96 For example, in 1969, when President Zakir Husain died in Office, Vice-President V. V. Giri served as the acting President of India. However, later, V.V Giri resigned from both posts (Acting President of India and Vice-President of India) as he became a candidate in the 1969 Presidential election in India. In this event, the then Chief Justice of India, Justice Mohammad Hidayatullah served as the acting President of India until the next President was elected. President can be removed by the supreme court per Article 71(1) for committing electoral malpractices and upon ceasing to possess the requisite qualifications to be president. President cannot remove judges once appointed by him without impeachment process per Article 124. An individual heads the autonomous institution of President. Judiciary/supreme court is also an autonomous institution represented by a team of supreme court judges with chief justice as its chief. President being head of parliament, Executive and supreme commander of armed forces is fully empowered by the constitution to fulfil his judicial responsibility. He can also take the expert advise of the Attorney General and also chief justice in performing his judicial role. It is President's duty to ensure that every state's governance is carried on in accordance with the provisions of the constitution under Articles 355 and 356. Chief justice/supreme court is also empowered by the constitution to repeal the unconstitutional activities of parliament and executive only after a fair trial. President's prime duty is to prevent unconstitutional decisions of union and state governments and parliament or state assemblies by denying his compulsory assent for making them into applicable laws. He is the foremost defender of the constitution who can pre-empt the unconstitutional activities of executive and legislatures. The other duties of President are just ceremonial as head of the country which are attached to him for being protector, defender and preserver of the constitution. The institution of President becomes redundant if the president is confining to other ceremonial duties only. Can intervene or nullify the unlawful actions of union/state governments and unconstitutional laws enacted by the parliament or a state legislative after presidential assent only. President has constitutional immunity for his unconstitutional, mala fides activities during their tenure but liable for judicial action/punishment for his unconstitutional activity after the term of presidency. However, per Article 361 (1), President is answerable to a court designated by either house of the parliament with a two-thirds majority for the investigation of a charge against him under article 61. Chief justice/judges of supreme court are also immune from punishment for not delivering correct judgements or for their incompetence and mala fides. However, Judges' verdict can be repealed by a higher level bench of other judges. President cannot be recalled by the people of India for not fulfilling his constitutional duties in case parliament is not impeaching the president or removed by the supreme court. Chief justice/judges of supreme court also cannot be recalled by the people of India in case parliament is not impeaching the judges. Elected in an extensive manner indirectly by the members of Lok Sabha, Rajya Sabha, and state legislative assemblies in a secret ballot conducted by the Election Commission Elected indirectly by the Lok Sabha members and secret ballot is not mandatory. Impeachment by parliament with majority of not less than two-thirds of the total membership of each house of the parliament for violation of the constitution as per Article 61 Steps down upon losing majority support in Lok Sabha. President can be removed by the supreme court per Article 71(1) for committing electoral malpractices and upon ceasing to possess the requisite qualifications to be president Similar to prime minister and ministers also. An individual heads the autonomous institution of President Union cabinet with Prime minister as its chief is collectively responsible. President being head of parliament, Executive and supreme commander of armed forces is fully empowered by the constitution to fulfil his judicial responsibility. He can also take the expert advise of the Attorney General and also chief justice in performing his judicial role. It is the President's duty to ensure that every state's governance is carried on in accordance with the provisions of the constitution under Articles 355 and 356 Rest of the governance of the union and reporting to the president on all important matters. Being the leader of the majority/ ruling party in the parliament, union cabinet takes lead in lawmaking by the parliament needed for policy finalisation on various aspects, annual budgets finalisation, planning and implementation, etc. President's prime function is to prevent unconstitutional decisions of union and state governments and parliament or state assemblies by denying his compulsory assent/government orders (GO) for making them into applicable laws. He is the foremost defender of the constitution who can pre-empt the unconstitutional activities of executive and legislatures. Prime minister/Union cabinet shall aid and advise the president who shall, in the exercise of his functions, act in accordance with such advice as long as not unconstitutional. prime minister shall communicate to the president all decisions of the Council of Ministers relating to the administration of the affairs of the Union and proposals for legislation and on President's desire submit related information. No minister shall decide on any matter without the council of ministers/ union cabinet approval per Article 78. President has constitutional immunity for his unconstitutional, mala fides activities during their tenure but liable for judicial action / punishment for his unconstitutional activity after the term of presidency The union cabinet has constitutional immunity from legal proceedings in any court for their mala fide and unconstitutional advice tendered by union ministers to the president per Article 74 (2). President cannot escape from his constitutional duty by citing constitutional amendment to Article 74 (para 2 of 1) which makes him abide by the Union cabinet's advice after sending for reconsideration. As clarified by the supreme court, the object of Article 74 (2) is only to make the question whether the president had followed the advice of the union cabinet or acted contrary thereto, non-justiciable. Refer page Article 74#Court cases for more clarity The union cabinet may escape from the punishment or responsibility for implementing unconstitutional laws citing Article 74 (2). President cannot be recalled by the people of India for not fulfilling his constitutional duties in case parliament is not impeaching the president or removed by the supreme court or resigns on his own on moral grounds Prime minister/ union cabinet cannot be recalled by the people of India till the end of his term in case he is not losing majority support in Lok Shaba or resigns on his own on moral grounds. In 1979, Prime Minister Charan Singh, did not enjoy a parliamentary majority. He responded to this by simply not advising the president to summon parliament. Since then, Presidents have been more diligent in directing incoming Prime Ministers to convene parliament and prove their majority within reasonable deadlines (2 to 3 weeks). In the interim period, the Prime Ministers are generally restrained from making policy decisions. Since the Indian constitution does not provide any time limit within which the president is to declare his assent or refusal, the president could exercise a "pocket veto" by not taking any action for an indefinite time. The veto was used in 1986 by President Zail Singh over the Postal Bill. The president did not give assent to the bill, arguing that its scope was too sweeping and would give the government arbitrary powers to intercept postal communications indiscriminately. Arunachal Pradesh governor who was earlier appointed by the ruling party at the centre, has been sacked by the president after the supreme court has quashed his unconstitutional acts. ^ "President, Vice President, Governors' salaries hiked to Rs 5 lakh, Rs 4 lakh, Rs 3.5 lakh respectively". Times Now News. IANS. 1 February 2018. Archived from the original on 2 February 2018. ^ Constitution of India (PDF). Ministry of Law and Justice, Government of India. 1 December 2007. p. 26. Archived from the original (PDF) on 9 September 2014. Retrieved 27 May 2013. ^ "India and Pakistan Become Nations; Clashes Continue" - New York Times Archived 1 April 2013 at the Wayback Machine Retri2013. ^ a b c Sharma, Brij Kishore (2007). Introduction to the Constitution of India. PHI Learning. ISBN 978-81-203-3246-1. Archived from the original on 31 December 2015. ^ a b Jai, Janak Raj (2003). Presidents of India, 1950–2003. Regency Publications. ISBN 978-81-87498-65-0. Archived from the original on 11 June 2016. ^ a b c d e f g "The Constitution of India". Archived from the original on 2 April 2012. Retrieved 21 March 2012. ^ a b Singh, Mahendra Prasad (2019). "Ambedkar: Constitutionalism and State Structure". In Roy, Himanshu; Singh, Mahendra Prasad (eds.). Indian Political Thought: Themes and Thinkers. Noida: Pearson India Education Services. p. 354. ISBN 978-93-325-8733-5. ^ Bhatt, Sheela (9 June 2006). "How Kalam asserted presidential power". Rediff India. Archived from the original on 16 April 2014. Retrieved 15 April 2014. ^ a b Gupta, V. P. (26 August 2002). "The President's role". The Times of India. Retrieved 4 January 2012. ^ a b Roy Chowdhury, Biswaroop (2006). Memory Unlimited. Diamond Pocket Books. ISBN 978-81-8419-017-5. Archived from the original on 27 April 2016. ^ Bakshi, P.M. (June 1956). "Comparative Law: Separation of Powers in India". ABA Journal. American Bar Association. 42: 554. ISSN 0747-0088. Archived from the original on 17 May 2016. ^ "Repeated promulgation of ordinances because a bill is held up in the Rajya Sabha is a violation of constitutional principles". Archived from the original on 27 September 2016. ^ "Re-promulgation of ordinances fraud on Constitution: SC". Archived from the original on 3 January 2017. Retrieved 3 January 2017. ^ "U.N. R. Rao vs Smt. Indira Gandhi on 17 March, 1971, SC verdict". Archived from the original on 8 February 2018. Retrieved 3 January 2017. ^ Woods, Patricia J. (2008). Judicial Power and National Politics: Courts and Gender in the Religious-Secular Conflict in Israel. SUNY Press. p. 185. ISBN 978-0-7914-7400-6. Archived from the original on 27 April 2016. ^ "Supreme Court of India – constitution". Supreme Court of India. Archived from the original on 30 August 2016. Retrieved 28 August 2016. ^ a b c d e f Kumar, Rajesh (2011). Universal's Guide to the Constitution of India. Universal Law Publishing. ISBN 978-93-5035-011-9. Archived from the original on 10 June 2016. ^ a b c d e Pratiyogita Darpan (March 2007). "Pratiyogita Darpan" (9). Pratiyogita Darpan: 60. Archived from the original on 8 May 2013. Retrieved 10 May 2012. ^ a b Bakshi, P. M. (2010). The Constitution Of India. Universal Law Publishing Company. ISBN 978-81-7534-840-0. Archived from the original on 3 May 2016. ^ Deogaonkar, S.G. (1997). Parliamentary System in India. Concept Publishing. p. 25. ISBN 978-81-7022-651-2. Archived from the original on 16 May 2016. ^ a b c Laxmikanth, M (2010). Indian Polity for Civil Services Examinations. Tata McGraw-Hill Education. ISBN 978-0-07-015316-5. Archived from the original on 24 April 2016. ^ a b Thorpe, Vandana (2008). The Pearson Guide To Bank Probationary Officer Recruitment Examinations. Pearson Education India. p. 12. ISBN 978-81-317-1568-0. Archived from the original on 25 April 2016. ^ Barrington, Lowell W.; Bosia, Michael J.; Bruhn, Kathleen (2009). Comparative Politics: Structures and Choices. Cengage Learning. p. 267. ISBN 978-0-618-49319-7. Archived from the original on 28 April 2016. ^ Omar, Imtiaz (2002). Emergency Powers and the Courts in India and Pakistan. Martinus Nijhoff Publishers. p. 129. ISBN 978-90-411-1775-5. Archived from the original on 3 June 2016. ^ a b Arora, N.D. (2010). Political Science for Civil Services Main Examination. Tata McGraw-Hill Education. ISBN 978-0-07-009094-1. Archived from the original on 13 May 2016. ^ History & Civics. Rachna Sagar. p. 14. ISBN 978-81-8137-037-2. Archived from the original on 9 May 2016. ^ Hardgrave, Robert L.; Kochanek, Stanley A. (2008). India: Government and Politics in a Developing Nation. Cengage Learning. ISBN 978-0-495-00749-4. Archived from the original on 19 May 2016. ^ Srivastava, Meera (1980). Constitutional Crisis in the States in India. Concept Publishing Company. p. 17. GGKEY:0BS5QYU7XF2. Archived from the original on 8 May 2013. Retrieved 31 May 2012. ^ "National Commission to Review the Working of the Article 356 of the constitution". 2001. Archived from the original on 9 May 2015. Retrieved 29 July 2015. ^ "Re-proclamation of President rule in Andhra Pradesh" (PDF). 2014. Archived (PDF) from the original on 24 September 2014. Retrieved 17 August 2014. ^ "Andhra Pradesh mired in President rule imbroglio". The Times Of India. Archived from the original on 6 July 2014. Retrieved 21 September 2014. ^ "Supreme Court Judgement: Bhim Singh vs U.O.I & Ors on 6 May, 2010". Archived from the original on 22 March 2012. Retrieved 21 March 2012. ^ "Article 293 and its application" (PDF). Archived (PDF) from the original on 18 May 2016. Retrieved 21 March 2016. ^ a b Sharma, Kanhaiyalal (2002). Reconstitution of Constitution of India. Deep and Deep Publications. ISBN 81-7629-405-5. Archived from the original on 19 May 2016. ^ general studies Indian polity. Upkar Prakashan. p. 106. Archived from the original on 8 May 2013. Retrieved 12 May 2012. ^ "The Presidential and Vice-Presidential Elections Act, 1952" (PDF). lawmin.nic.in. Archived (PDF) from the original on 28 January 2015. Retrieved 3 September 2013. ^ "The President and Vice-President Election rules, 1974". Ministry of Law & Justice, Government of India. Archived from the original on 2 November 2012. Retrieved 31 May 2012. ^ "Election to the president of India" (PDF). Election commission of India. p. 16. Archived (PDF) from the original on 10 March 2014. Retrieved 27 May 2013. ^ Great Britain. Ministry of Overseas Development. Library; Great Britain. Overseas Development Administration. Library. Public Administration. Upkar Prakashan. pp. 167–. Archived from the original on 8 May 2013. Retrieved 11 May 2012. ^ "Balance of power in presidential race". NDTV. 22 May 2007. Archived from the original on 7 October 2007. Retrieved 6 May 2012. ^ Pratiyogita Darpan (October 2007). Pratiyogita Darpan. Pratiyogita Darpan. p. 67. Archived from the original on 8 May 2013. Retrieved 31 May 2012. ^ "President, Vice President, Governors' salaries hiked to Rs 5 lakh, Rs 4 lakh, Rs 3.5 lakh respectively". TimesNow. 1 February 2018. Retrieved 2 April 2018. ^ "President gets richer, gets 300 pc salary hike". CNN-IBN. 11 September 2008. Retrieved 9 November 2008. ^ Randhawa, Gurcharan Singh; Mukhopadhyay, Amitabha (1986). Floriculture in India. Allied Publishers. p. 593. ISBN 978-81-7023-057-1. Archived from the original on 23 June 2016. ^ Randhawa, Mohindar Singh; Randhawa, Gurcharan Singh; Chadha, K. L.; Singh, Daljit; Horticultural Society of India (1971). The Famous gardens of India. Malhotra Publishing House. Archived from the original on 28 April 2016. ^ India Foreign Policy and Government Guide. International Business Publications. 1 May 2001. p. 39. ISBN 978-0-7397-8298-9. Archived from the original on 30 April 2016. ^ "Parliament approves salary pension hike for President, Vice-President and Governors". Archived from the original on 27 May 2015. Retrieved 26 May 2015. ^ "Sections 7 & 8k, The representation of the people act,1951" (PDF). Archived (PDF) from the original on 1 May 2015. Retrieved 2 July 2015. ^ "Sections 13 to 20, The Presidential and Vice-Presidential Elections Act, 1952". Archived from the original on 2 February 2016. Retrieved 2 July 2016. ^ a b Bhardwaj, A.P. Study Package For CLAT and LL.B Entrance Examinations. McGraw-Hill Education (India). pp. 238–239. ISBN 978-0-07-107468-1. Archived from the original on 3 June 2016. ^ "Rameshwar Prasad And Ors vs Union Of India And Anr on 24 January, 2006". Archived from the original on 16 October 2010. Retrieved 2 July 2015. ^ "The Prevention of Insults to National Honour (Amendment) Act of 1971" (PDF). Archived from the original (PDF) on 12 September 2014. Retrieved 2 July 2015. ^ Subrahmaniam, Vidya (10 November 2005). "K.R. Narayanan – President who defied stereotype". The Hindu. Chennai, India. Archived from the original on 22 July 2012. Retrieved 15 June 2012. ^ "President appoints Manmohan Prime Minister". The Hindu. Chennai, India. 20 May 2004. Archived from the original on 3 June 2012. Retrieved 15 June 2012. ^ Sundar Rajan, K.T. (4 December 1996). "Presidential Years". Outlook. Archived from the original on 3 June 2012. Retrieved 13 June 2012. ^ Bhattacharjya, Satarupa (12 June 2006). "Show Of Dissent". India Today. Archived from the original on 26 March 2013. Retrieved 13 June 2012. ^ Interview Archived 3 February 2006 at the Wayback Machine with K. R. Narayanan on Independence day, 15 August 1998; by N. Ram, Editor, Frontline ["K. R. Narayanan in conversation with N. Ram", The Hindu, 10 November 2005. Retrieved 24 February 2006]. ^ "Kalam returns Office of Profit Bill". CNN-IBN. 31 May 2006. Archived from the original on 20 June 2013. Retrieved 2 May 2012. ^ "Signing office of profit bill was toughest decision:A P J Kalam". The Economic Times. PTI. 18 July 2010. Archived from the original on 11 May 2013. Retrieved 2 May 2012. ^ "'Kalam erred on Office of Profit bill'". The Times of India. PTI. 22 April 2008. Retrieved 2 May 2012. ^ "Arunachal Pradesh Governor Jyoti Prasad Rajkhowa Sacked". Archived from the original on 13 September 2016. Retrieved 12 September 2016. This page was last edited on 19 April 2019, at 01:17 (UTC).